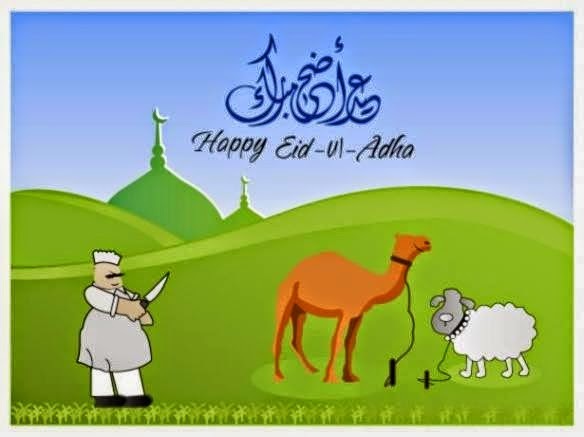 Eid-ul-Adha 2014 Mubarak To Everyone! Let us take the pleasure of wishing all the beloved and loyal readers of MBT and followers of all blogs under the STC Network, a very joyous and Happy Eid-ul-Adha 2014 Mubarak! Wishing you a peaceful Eid on behalf of the entire STC Network team! May this joyous and Holy occasion of Eid-ul-Adha bring peace and joy to you, your family, and your friends, and may shower on you the best of Allah's blessings. For Muslims, Eid-ul-Adha is the biggest annual occasion, and it is celebrated during the same days as the Hajj, or Pilgrimage is performed, which is one of the five basic pillars of Islam. Millions of pilgrims performed the holy sacrifice of animals today in Makah during the occasion of Hajj yesterday, as it was the first day of Eid there. This first day of Eid is being celebrated in Saudi Arabia, Gulf States, Europe, USA, India and Far Eastern countries. Large parts of Pakistan and other neighbouring countries will celebrate their first day of Eid tomorrow as per the Islamic Hijri (Lunar) Calendar, and hundreds of millions of Muslims living here will be performing the holy sacrifice in the memory of Prophet Abraham (PBUH). Making sacrifices isn't an alien concept, at least not in any of the Abrahamic religions (Christianity, Judaism etc) which are all very similar to Islam. The Muslim practice of sacrificing animals dates back to Hazrat Ibrahim (A.S) (known as Abraham), who was willing to sacrifice his son (Hazrat Ismail A.S) according to Allah’s order. Allah the Most Merciful was pleased with Abraham's willingness and obedience, and so spared Ismail, miraculously replacing with a sheep (or its kind) by His order. That’s why this is known as “Feast of Sacrifice’. To revive this spirit, Muslims slaughter some specific animals on the day of Hajj and then distribute their meat in accordance with the Islamic teachings. This is to remind Muslims that they should obey the orders of their Lord without question, even if they have to sacrifice the most beloved being for Him. This also teaches Muslims to be compassionate towards the poor, and to help those in need. Therefore, all the meat isn't used for 'celebration'. A certain part of it is distributed among the poor as per Islam's teachings, so that the poor can also enjoy good food as well. Saying all this wraps up today’s post. May you grasp the true essence of this Eid, and may Allah shower His countless blessings upon you and your family.